In our experience RGB are the most common connection to piles. Due to their versatility RGB are frequently requested by structural engineers as a reliable alternative to traditional strip footings. They suit most super structure designs accommodating all different shapes and sizes of new buildings. RGB are suitable for all ground conditions and by installing approved heave precaution they can also withstand potential ground movement mainly clay heave. Unlike reinforced concrete rafts, RGB can be installed where the existing ground levels are uneven or the landscape is slopping in any direction. RGB can also be raised or lowered to prevent the costly exercise of diverting or removing live underground services. 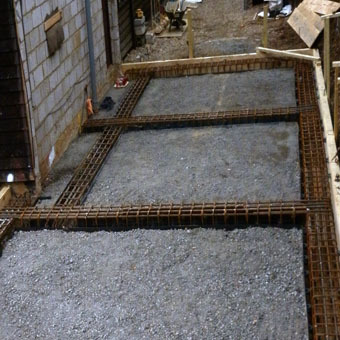 If you are extending a property that is built on pile and ground beam foundations the new foundation can be structurally connected to the existing one. In some cases, connecting to the existing RGB can reduce the number of piles required.